« You are the salt of the earth. But if the salt has lost its power to purify, flavor, and preserve, how can it be made salt again? Sweet surrender… have faith, hope, love; ask, seek, knock. Dear Lord God, Abba Father. ‘thank You for reminding me of truth today. The truth that doubt doesn’t have the final say. Disease doesn’t have the final say. Heartbreak doesn’t have the final say. Even death doesn’t have the final say. The only One who gets the final say in my life is Jesus. He is the Resurrection and the Life. My future and my present hope. So I’m choosing to declare today that even if You don’t do what I keep asking, I will trust You still.’ In Jesus name I pray. Glory be to the Father and to the Son and to the Holy Ghost; as it was in the beginning is now and ever shall be, world without end. Amen. Until now, you have asked nothing in my name. 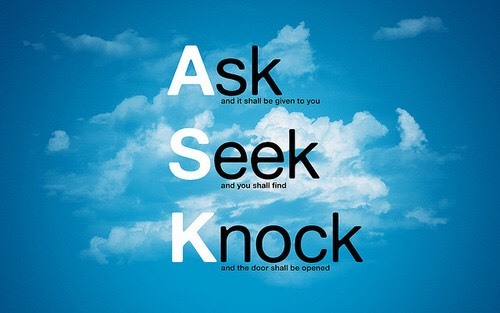 Ask, and you will receive, and your joy will be full. This entry was posted on November 7, 2018 at 6:24 am and is filed under One Walk. You can follow any responses to this entry through the RSS 2.0 feed. You can leave a response, or trackback from your own site.